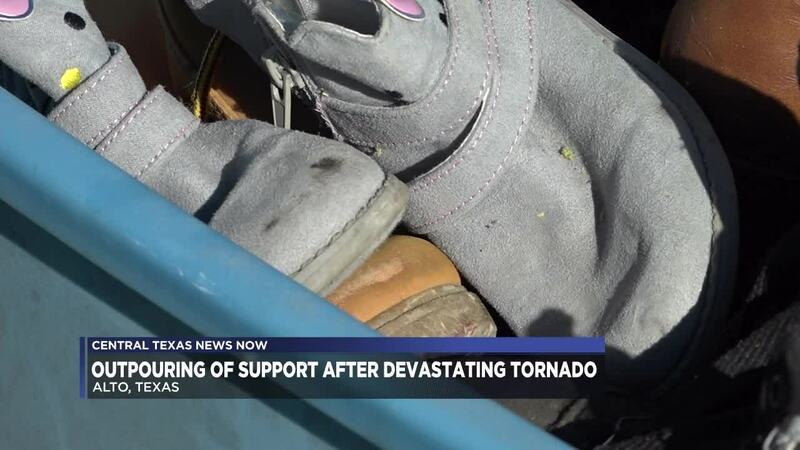 ALTO, TX — There is an outpouring of support after a pair of tornadoes devastated parts of Texas. Among the areas hit the hardest include the Cherokee County town of Alto. “I couldn’t just sit around and see Alto on its knees and not do anything about it. Those are families and houses and businesses, and they’re gone. They’re all gone,” said Victoria McDonald, who was born and raised in Alto before moving to Lampasas. After word spread about the extensive damage, McDonald turned to social media to collect donations for those impacted by the tornado. She packed up her car with what she could fit and headed to Alto. Meanwhile in Alto, The River Church is being used as a staging area for first responders, volunteers and those who rode out the storm. "The Lord blessed us with a generator after the hurricanes so we are probably the only place in town that has power," said Pastor Ron Rose, of The River Church . The Red Cross is assisting those displaced by the storm. "It's nice to be able to have these people here and welcome us in. We have EMTs checking everybody out," said Emma Abbey, who took refuge in the church. There are a number of ways to donate to efforts. In Alto, donations are being collected at The River church.